Green smoothies are a convenient, delicious and nutritious way to meet your daily fruit and veggies requirement. Unlike some so-called “fruit smoothies” that are loaded with sugar, green smoothies use only the natural goodness of fruit and vegetables. Surprisingly, these healthy smoothies taste absolutely heavenly and can become pretty addictive. 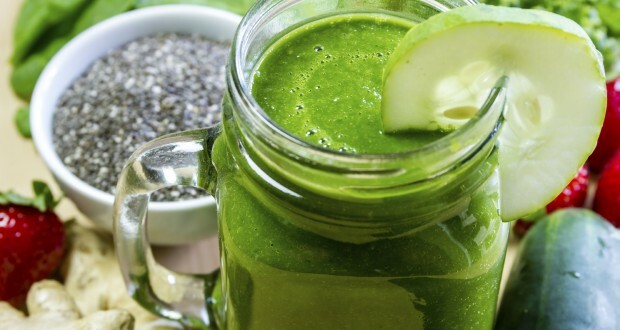 The immense health benefits of drinking these green smoothies are simply staggering. With a 6:4 ratio (6 parts fruit, 4 parts greens), they not only taste good, they provide the nutrition needed by the body. Consuming two to three cups is enough to give your body the energy it needs to get through the day. Guzzling down those leafy greens will also detoxify your body by ridding your bowels of toxins. Daily consumption of green smoothies also reduces, if not completely eliminates, your cravings for sugar-rich and other processed foods. Consuming your greens this way naturally minimizes your oil and salt intake. For those intent on losing the pounds, green smoothies are natural and healthy alternatives to meal replacement shakes whose safety is still subject, especially in long-term use. Because green smoothies are loaded with all the nutrients your body needs, drinking them in the mornings and in the afternoons when your stomach is either empty or not really full, will satisfy whatever hunger cravings you may have so you’re less tempted to pig-out on those chips or sugary treats. The detoxification ability of green smoothies is vital to having glowing, radiant skin. When the body is able to eliminate toxins and keep the bowel moving for at least 2 times in a day with the aid of green smoothies, you can expect your skin to clear up and retain a youthful, shiny glow. Because they’re liquid, they’re easily digestible and are thus stomach-friendly. Whereas meal replacement shakes are low in fiber, green smoothies are rich in it and barring a certain adjustment period that varies from individual to individual, they help maintain regular bowel movements. For children, introducing green smoothies to them early in life sets the foundation for establishing healthy eating habits. More importantly, the vitamins, minerals and other nutrients also strengthens their bones and develops tissue essential to growth and development. Finally, green smoothies are easy to prepare. It only takes 5 to 10 minutes and cleaning up is a cinch! Guzzling down greens is a sure way to get your daily fruit-and-vegetable requirement. Because of today’s busy lifestyles, green smoothies are a great and easy alternative to cooking those vegetables. Not only are these beverages convenient, they bring unparalleled health benefits to you and your family.